I know there's a way to do side-by-side pictures, and that anyone with even a small knowledge of photo things could figure it out. Obviously, I am not technically, or photographically minded. People have been telling us how much Baby Plum now resembles his brother. It's funny, because we think they look less alike now than they used to. I'm fairly certain it's the hair, although as the pictures will show, Little Elvis had a lot less hair when he was two. Just for fun, I threw some pics of me at that age. Baby Plum's coloring is different, but he's really a little version of me. Baby Plum rocking the overalls at 2. Little Elvis showing off his socks at 2. Pensive Baby Plum at 2. Thoughtful Little Elvis at 2. 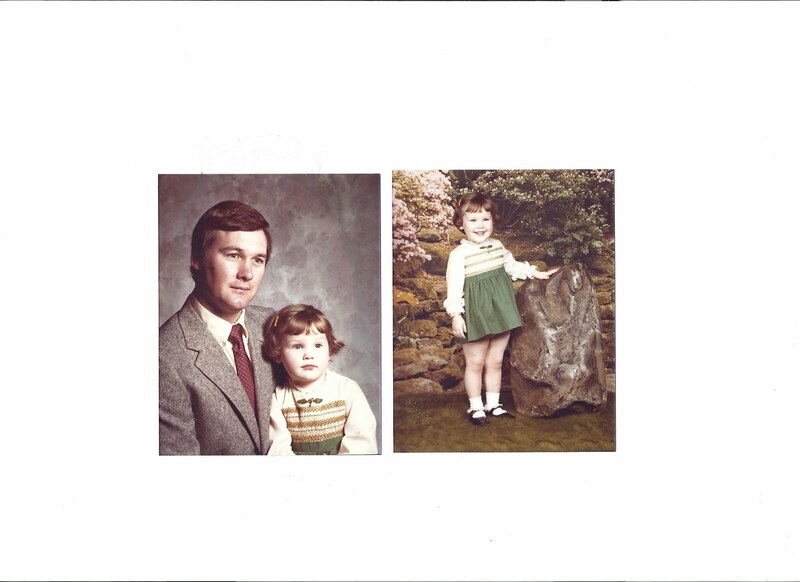 Me at two with my father. The picture's a lot smaller here than the others. Again, a photo thing. Not my area of expertise. My mom and grandmother have been really noticing similarities between baby me and Baby Plum. He's apparently got a lot of my expressions. I don't really have many pictures of little Bob, and the ones I do aren't scanned. If Baby Plum is a mini-me, Little Elvis is a Baby Bob. They have the same eyes and expressions. They both even squint the same eye when in the sun. Wonder who Cheese Puff will look like? I love old photos! So fun! I can definitely see the resemblance between you and Baby Plum! Sometimes, I have the impression that my boys look like different parents at different ages. Around the age 12 months, everyone says they look like Fritz. I personally think it might have to do with the chubby cheeks, but don't tell Fritz! although in the past, i have seen similarities and was surprised, these pix don't look alike to me. and i couldn't tell about you and plum. but i get from everybody!! that the bean is my own mini.